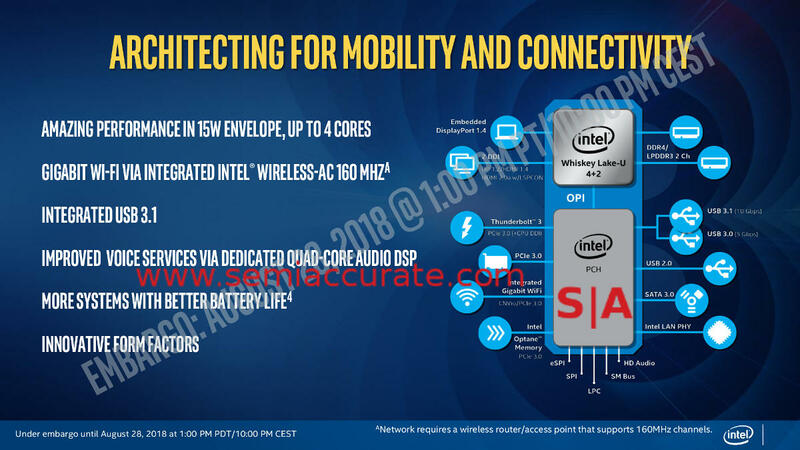 Intel is releasing the ‘new’ Whiskey Lake and Amber Lake mobile CPUs today bringing almost nothing new to the table. That said the hype is pretty amazing until you read the fine print like SemiAccurate did. Lets start out with the good news, there are six new Intel mobile CPUs, three 15W U-Series and three 5W Y-Series. The top two Us are 4C/8T while the remaining parts are 2C/4T. These parts are still labeled 8th Gen but since the last three or four generations are all Sky Lake with vanishingly small tweaks, SemiAccurate considers this nomenclature to be worthless. The lineup looks like this. As you can see the SKUs released range from m3 to i7 models with base clocks in the 1.1-2.1GHz range. 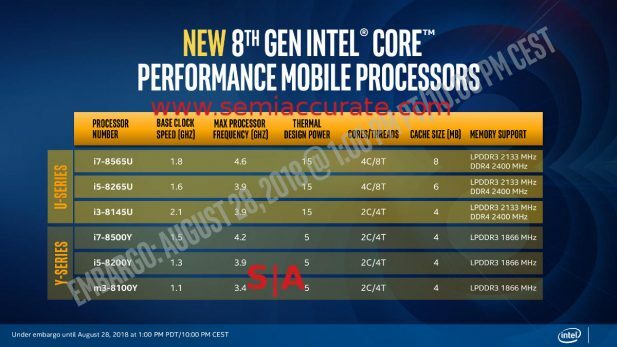 Turbo is quite a bit higher topping out at 3.4-4.6GHz for single core but Intel did not supply the multi-core turbo tables this time. Given the wattage limits of the CPUs, 5 or 15, don’t expect to hit those 1C max turbo frequencies for more than a few seconds, that number is simply a marketing gimmick. More interestingly the memory frequency is LPDDR3-1866 on the 5W SKUs, LPDDR3-2133 or DDR4-2400 on the 15W devices. The 5W SKUs not supporting any DDR4 is a curious choice that speaks volumes about the platform cooling capabilities, it is the same silicon as the 15W SKUs so the support is on die. The ‘details’ are a little thin this time around but there is one big bang, Gigabit Wi-Fi aka 802.11ac with 160MHz channels. Now your laptop can communicate with your three year old cell phone at full speed, oh happy day. Lots of silicon area is wasted on Thunderbolt 3, at least on the chipset side. Cannonlake has it integrated onto the die as we exclusively told you years ago and it’s inclusion here is… umm… a bullet point on the slide. Intel also slid ‘Optane Memory’ into the chipset but all that means is there are PCIe lanes. Speaking of which there are no PCIe lanes on the CPU die meaning any I/O is going to be quite crippled, the OPI(?) link is far too slow to support modern I/O and anything else. There are 16 PCIe3 lanes off the PCH but that link is slower than the CPU to PCH link so… elephant breathing through a drinking straw here. Everything else is routine, expected, and sparse. As far as performance claims go, this launch is another masterclass in trying to find the bright side of something that reflects no light. All comparisons are to a five year old PC, in this case the mid-range i5-8265U vs an i5-4200U. The claim is that the new part is “2X faster than a 5-year old PC” and given that we are looking at 4C vs 2C and 24 shaders vs 16, that 2X claim seems pretty low. The new Skylake/Coffee Lake core are unquestionably better than the 4200’s Haswell architecture and the GPUs are similarly more advanced. Coupled with higher clocks, a full shrink from 22nm to 14nm, and significantly faster SSDs, you would expect the new parts to utterly devastate the 5-year old CPUs. Ascribe this lack of performance to whatever you want but at least you know the reason the claimed 10% improvement over the last generation mentioned in the briefing was not put into the slides at all. 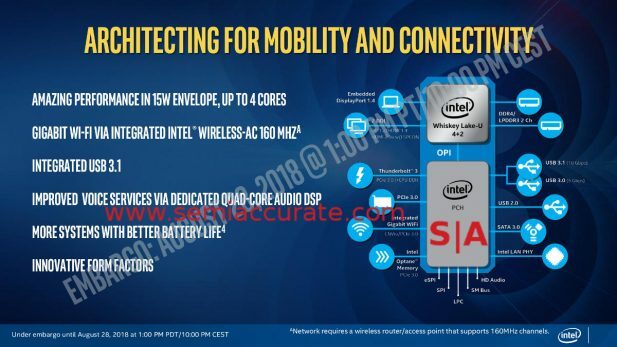 Initially we thought the lack of performance was due to Spectre/Meltdown/L1TF/Foreshadow fixes but Intel claimed that the core was the same as the ‘last generation’ on their briefing call. Since Coffee Lake didn’t have the fixes, this ‘new’ CPU probably won’t either so that avenue is closed off. In any case if you are on the cusp of buying a new laptop, you might want to wait until the hardware security fixes are put in place before you spend your money.